StaticOrb Passive Water Intake Screens are the most economical and reliable system for fish protection (capacity chart) and debris removal from surface water supplies. StaticOrb intakes are designed to admit water at a low, uniform velocity, providing optimum protection for aquatic life and so that refuse material remains in the water. Now available are Screen Services' recently developed high-efficiency model BTJ StaticOrb intakes, which we believe to be the best technology available for protection of aquatic life. BTJ model intakes provide significantly better uniformity of flow velocities, which can mean improved protection of fish while reducing costs. For additional information, please refer to this announcement (110K PDF). StaticOrb Water Intake Screens have no moving parts, and are constructed from corrosion resistant materials for a long service life. Debris is excluded by the smooth screen surface and remains in the water source, eliminating the need for on-shore handling of debris. The screens may be placed away from the shoreline, in an area of optimum water quality, remote from sensitive marine organisms. In particularly adverse conditions or where required to meet local regulatory requirements, an air backwash system can remotely clear accumulated debris from the screen surface, employing manual or automatic controls. 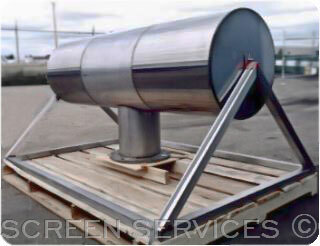 Screen Services also provide screen panels for fish diversions or other projects with large water volume requirements. For more information, please download our StaticOrb (240K) brochure (Adobe Acrobat format). For a quote on a StaticOrb Intake Screen, please download, fill in, and send us a copy of our quote request (88K) form (Adobe Acrobat format). And for a quote on the accompanying air system also choose the desired automation level per StaticCharge Air Scour System Quote Request (99K). There do not appear to be any DFO publications available online related to Atlantic or Arctic marine intakes. We welcome any information updates for these areas. Please email: .